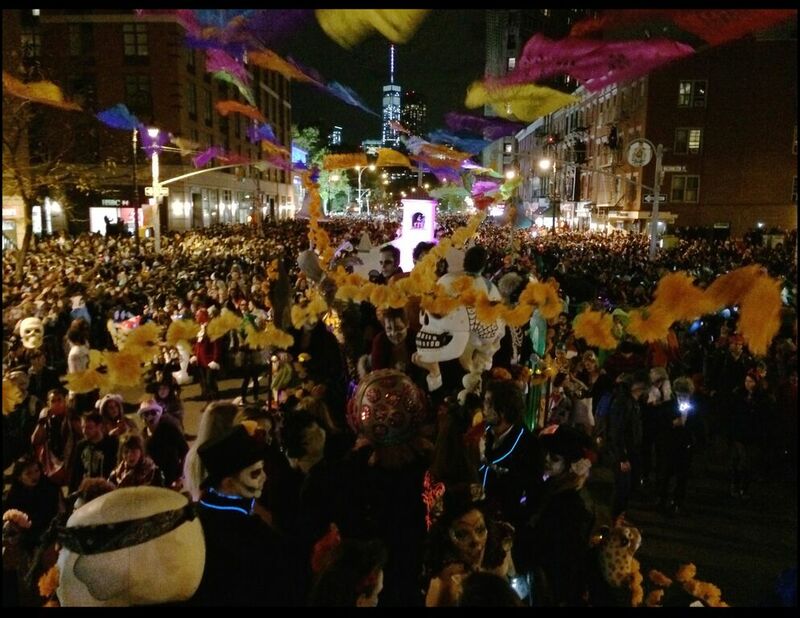 For 43 years, New York City’s Village Halloween Parade has been showcasing the creative spirit of the city in the form of giant puppets, neon-colored floats, and thousands of participants in their own costume creations. Though touted as the world’s largest annual Halloween parade, the production is run by a small non-profit group led by artistic director Jeanne Fleming. She’s now entering her 38th year with the parade, and she likens her job to “being command console of the Starship Enterprise” — she’s in charge of coordinating with artists, sponsors, police, spiritual leaders, and 47 different ethnic communities in New York, all of whom are participating in the parade. With just a few days left before the big night, I got a chance to talk to the woman whose life is Halloween, 365 days of the year. So this is a year-round preparation for this one night, right? Yes, I don’t think there’s a day that goes by that I’m not doing something with Halloween. I love Halloween because it’s a celebration of the creative imagination in everyone, not just artists. I really love awakening the creative in others, who don’t wake up and create things every day. It’s about that special way of gathering people together that is not about work, ethnicity, sponsorships, or gender. It’s really about your creative imagination and what you want to do, and that’s why I’ve worked on it for so long. I feel it’s an authentic event. The funny thing about Halloween is, no one is there who doesn’t want to be there. Some holidays, they’re home holidays — you have to go home for Christmas, or Thanksgiving. Halloween, you don’t have to do anything. You can do whatever you want, and it’s about that freedom. So you’re there with your friends, you’re there by yourself, you’re there with your new family. Everyone who’s there is happy to be there. The parade is going to be broadcast on TV, but do you have any plans for this parade to be streamed online? This comes up now all the time. It’s difficult, because television pays us for broadcast rights, and it’s very hard to figure out how to monetize the live stream. At the same time, there will be people [privately] live-streaming the parade. But I also love that everybody’s making their own movie. The fact that there are 80,000 ways to see the parade, that is of interest to me. It’s crucial that the parade raise money in order to be able to pay for insurance and all the things we have to pay for, so that’s one of the real dilemmas we face with live-streaming. We gotta figure it out, because you’re right, TV is an antique medium. The parade really reflects what’s going on in the mind of New Yorkers and what’s happening in the world. This year with the election, there’s going to be a giant Hillary pantsuit in the parade. The parade was the first event that happened in the city after 9/11, and we did a lot after Hurricane Katrina. So the parade is very responsive to what’s going on in the world in a playful yet serious way. This year’s theme, Reverie, stresses “unplugging” from the world around us. What was the inspiration behind it? Years ago, we used to notice that when we went down the parade route, the crowds would cheer for our performances. And we noticed that wasn’t happening anymore. No one was clapping. Everybody had a phone in their hands, so we weren’t getting that reaction. So we did a piece called “Eye Of The Beholder,” where we made a giant eyeball with a whole bunch of smaller eyeballs, and we aimed the cameras at the audience so we were looking back at them. 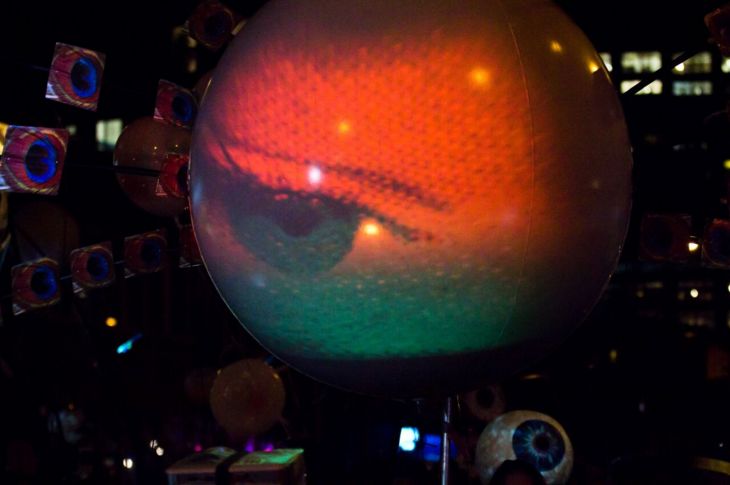 We had people sending pictures of their eyes, and we projected people’s eyes on this giant eyeball that looked back on the crowd. So part of what this year is about, it’s about unhooking and being less distracted, taking a moment to just be with yourself. If we could find a way to encourage people to do that, even just for a little while, it would be good for everyone as a whole. So… I’m working that night. [Laughs] Many years ago, my friend bought me a beautiful hot pink leather jacket. I’ve been wearing it for a very long time, and it’s kind of become iconic. Everyone knows who I am because they’ve seen me in that jacket for years and years! The Village Halloween Parade begins at 7 p.m. on October 31, and runs north up Sixth Ave at Canal street.